Above ground pools are the latest trend setter and a relief to many swimmers across the world. It has to be added that these pools require less maintenance in comparison to in ground pools. One more thing that has to go in its favor is that they are children safe, can be easily installed and of course can be managed in an effortless manner. 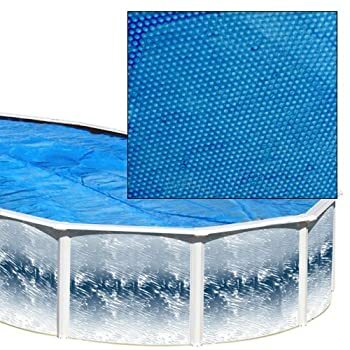 In this line of discussion mention has to be made about Splash Above Ground Round Pool Package has become a bestseller among the more permanent solutions to an above ground pool. 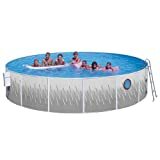 This is no doubt a top rated above ground pool but you might not want to move it around once it is setup. Preparation and setting up is considerably more elaborate with this pool package compared to the other less complicated Intex Metal Frame pools. Yet this pool gives a look of luxury and elegance which the other cheaper varieties fall short of. Let us find out what makes these pools so special that has caught up everyone’s fancy. Design – It comes with a strongly painted and hot-dipped 7 inches galvanized steel ledge. This certainly makes the product long lasting and it is very true that this is one of those above ground pools that will serve for life. There are no doubts that these pools not only look good but are designed with state of the art technology. This means these can be put up without much of a problem. Filter – Now this is what we say makes it different from the rest of the flock. It comes with a big sand filter of 1 horse power that is undoubtedly easy to maintain over the cartridge ones. This is another reason why investing in this pool is a good idea. Installation – To be honest it is not at all an easy task to install a pool in your backyard, let alone an above the ground one. However the manufacturer has made it easy by providing a step by step video of the installation procedure. This makes the whole process trouble free to some extent. Usually it takes around 2 days to get the pool set up and running for swim. 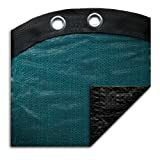 Supplies – Not to mention that this package consists of some good quality above ground pool supplies like an enduring vinyl liner that extends to 20 gauge. It also comprises of resin ladder to access the pool with ease along with a safety barrier, 1 HP pump, motor and a Thru-the-Wall skimmer. We recommend you research some more on our pool ladder reviews to go for a sturdier one. Support and warranty – The manufacturer is so confident about the quality of this product that they have a 15 year pool warranty and a free lifetime of customer support. What more can you ask for? Maintenance – Yes you heard us, Splash Pools are low on maintenance provided you keep a check on them. Like avoiding it getting rusted by painting it with rust proofing etcher or primer and also supporting the blocks well to keep it balanced. It is true that above ground pool maintenance can really become a painless task if you keep it well managed. 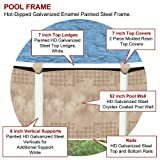 We recommend you keep an eye on our tips and trick of pool maintainence at Above Ground Pool 101. Reasonable – Another point that makes these pools so popular is their pricing being so reasonable. With the advent of online merchants things have become more competitive and people can now easily buy these products at discounted prices. Nothing is perfect in this world and Splash Pools are no exception to this and what most people dread is the installation. Now that the manufacturers have provided a DVD, hope this has been sorted out a bit for some at least. Another objection that we get to hear is that these pools are big (or should we say spacious) enough! Why should you invest in Splash above ground Pool Package? We would answer this as if you really like swimming outdoors and want to spend quality time your loved ones, then this is a good way to do so. You can show that you care for your family and most definitely the family time by installing a Splash above the ground pool. Moreover if you have kids in your family you will quite obviously like to hang around with them or throw a pool party for them. You can enjoy all the benefits of a pool minus the maintenance of an in ground pool. Our final words on Splash Pools Above Ground Round Pool Package Reviews would be to say that they can serve you a lifetime. We recommend the use of above ground pool solar heater so that you keep up with your swimming quest even during the winter months and conserve energy at the same time. Our verdict goes into their favor as these pools are sturdy and can serve you longer in comparison to the others. We made a lot of research and ground work in providing the reviews. Our sole aim is to help you make an informed decision before you spend your money on an above ground pool. 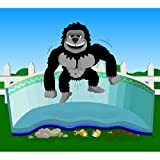 If you find this review helpful then do like our Facebook page as that will help you get more information along with the latest deals on various Above Ground Pool Supplies and Above Ground Pool Accessories. You would also get to connect with other Pool users and engage with them to find answersto similar issues which pool users face. Moreover we would like you to share ideas, opinions and views in regards to these above ground pools whenever you like. Feel free to contact us and comment on the posts if you like reading them.